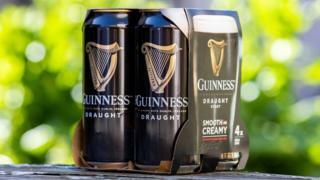 Plastic ring carriers and shrink wrap will be also removed from packs of Harp, Rockshore and Smithwick's beers, as part of Diageo's £16m initiative. The change will be phased in with multi-can packs sold in "100% recyclable and biodegradable cardboard" in Ireland from August this year. Many companies have been committing to being more green after concerns about plastic waste were highlighted in shows such as the BBC's Blue Planet 2, narrated by Sir David Attenborough. Last month Coca-Cola started releasing information on how much plastic it used - three million tonnes of plastic packaging in one year. That was part of a report by the Ellen MacArthur Foundation, which is pushing for companies and governments to do more to tackle plastic pollution. In total, 150 companies have pledged to reduce their plastic usage as part of the campaign. Diageo's bottling and packaging plant in Northern Ireland will be the first site producing the new packs, with the firm investing £8m in its east Belfast plant. Diageo says under 5% of its total packaging is plastic and the changes will reduce usage by over 400 tonnes annually. "We already have one of the most sustainable breweries in the world at (Dublin's) St James's Gate and we are now leading the way in sustainable packaging. This is good news for the environment and for our brand." Friends of the Earth plastic-free campaigner Emma Priestland welcomed Diageo's move, but added that new legislation was needed to "end the scourge of plastic pollution that harms our environment and wildlife". Greenpeace spokesperson Mirjam Kopp said: "It's great the Diageo is looking at ways to move away from plastic packaging. "[But] by replacing plastic packaging with cardboard sleeves and boxes, Diageo will increase its reliance on pulp and paper, increasing the pressure on forests and potentially leading to more deforestation that, in turn, accelerates climate change. The real solution is to end throwaway packaging across the board and embrace systems of refill and reuse." Prime Minister Theresa May has pledged to ban all avoidable plastic waste in the UK by 2042.